Our UiPath certified experts will work with you to determine the appropriate use cases and develop an overall strategy for the UiPath platform. Our 360° UiPath consulting services have you covered from process definition and optimization for automation through establishing governance necessary to manage your digital and human workforce. Our team has a deep background in software engineering going back to the infancy of RPA and have developed large-scale programs from scratch that have saved customers hundreds of millions of dollars. Using this experience, we are able to design, develop and deliver attended and unattended bots plus manage the orchestration of the digital workforce to meet any demand. Organizations needing Center of Excellence (CoE) governance, ongoing development assistance, monitoring, maintenance, analytics or ongoing training and support to meet the enterprise’s demands for automation, can rely on our team. Drag and drop interface records your work routine and equips employees with the fast and easy configuration of robotic workflows. Extend RPA capabilities to your specific business applications with smart, flexible robots that are under your control. Enterprise-wide productivity, flexible operations, cloud and on-premises deployment. The highest level of security. UiPath provides the most intuitive and feature-rich automation development environment. Our highly visual process designer equips employees for fast and easy configuration of robotic workflows. Simply drag-and-drop activities into the workflow or let the recorder get you started. This unique feature records your usual work routine and replays it automatically. Automation, full speed ahead. Leaders in Computer Vision Beyond automating business processes across all applications, user interfaces and legacy environments, UiPath robots have “eyes” that see the screen and understand relationships - just as human vision does. Enabling data capture and process automation regardless of changes in screen elements’ position. 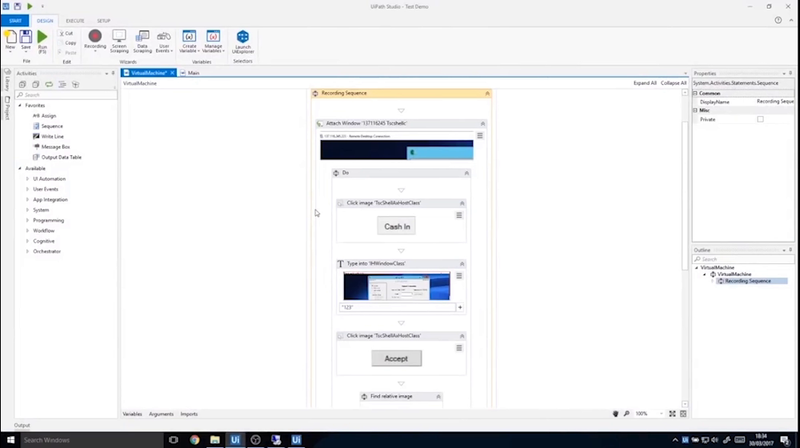 Citrix Automation UiPath’s computer vision technology automates with unmatched speed applications accessible through Citrix or remote desktops. For businesses with security imposing remote access to applications, UiPath provides the highest automation accuracy and stability. Control & Flexibility UiPath robots are greatly flexible under user control. Allowing smart, customized scheduling decisions, and constantly balancing priorities, requirements and ongoing demand with availability. Reassign robots or deploy new ones instantly. Stable Execution for Your Business By combining cutting edge technology and industry standards, businesses can extend RPA capabilities to specific business applications, reliably. UiPath’s automation engine is powered by Microsoft’s dynamic Workflow Foundation, the same as in SharePoint and Visio. Deploy anywhere, in the cloud or on premises and manage everything in one place. Users in different business units and geographies can operate autonomously from one secure server. Centralized management of critical operations allows strong governance and compliance: release management, remote control, scheduling, queue/robot workload, custom roles authorization and asset management. UiPath runs with a locked screen so automated processes can run in total privacy, and uses TSL 1.2 protocol for data protection in the cloud, so that businesses can deploy at a global scale reliably, without compromising security. UiPath is built with a flexible architecture to allow tight and scalable integration of cognitive capabilities from Google, Microsoft, IBM & ABBYY cognitive and OCR services. This is intelligent automation, delivering: language detection, the extraction of unstructured data, and sentiment analysis. Robots learn in real time. They understand language meaning and emotion and use it for complex decision-making. Insight builds foresight, the golden ticket to better and smarter business decisions. Know at all times how your enterprise is performing and derive opportunities for improved efficiency, strategically. Every action every robot performs, every user decision and change are tracked in real time and logged centrally on the server to provide full visibility into process execution and operational statistics. UiPath brings the power of ElasticSearch monitoring technology and a highly customizable, out of the box solution for data visualization from Kibana. Personalized visual dashboards are adapted for each operational requirement. Request to download UiPath platform and obtain a free license for the use of the software for 60 days. With the downloaded software, you will be able to view and test all UiPath functions in an unrestricted fashion. Don't forget to ask us about the discounted licensing rates that we can offer to our customers thanks to our exclusive partnership with UiPath.